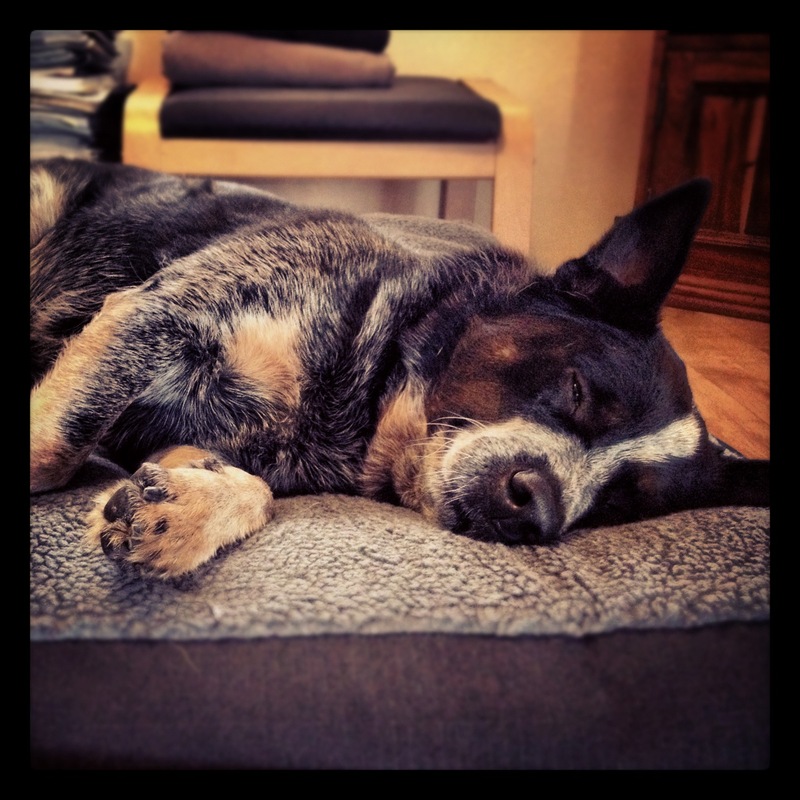 It’s been eighteen months since The Dog came into our lives and it is about time for an update on how he’s going. To say that he is in love with The Driver would be an understatement. Clearly he’s a man’s dog as his daily life revolves around what The Driver is doing. He’s literally a love-sick puppy dog who panics when he can’t see, hear or find his bro. Suffice to say, The Dog has settled in well, perhaps too well. Some might say ‘indulged’ with a bed in nearly every room – not that he needs the dog bed in our bedroom as he seems to think our bed is his. The Dog’s daily routine consists of a casual walk around the neighbourhood, a morning sleep, an afternoon sleep, meals, ball-chasing, and waiting for his bro to come home from work. In between times, he enjoys sitting under the outside table where the flies leave him alone – another pet hate of his. But we can’t imagine our lives without The Dog. His character and personality are completely different to our previous beautiful blue friend (RIP Skip), but he keeps us delightfully entertained with his expressions, ‘issues’ and habits. The list of things he doesn’t like grows by the day. The latest addition being bean-bags. The big comfy ones you sit in to watch TV. Who knows what happened in his past life, but bean bags sitting quietly and stationery in the corner pose a potentially humungous threat to life as he knows it… And then there’s the delivery guy who brings parcels to our front door. You would think by now The Dog would know him – instead, it would appear that The Dog would prefer to eat him. 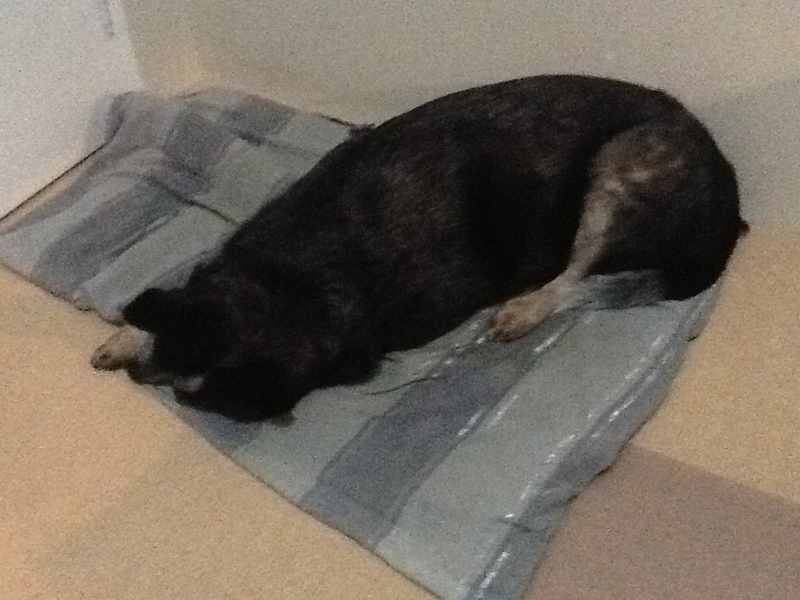 Thunderstorms and lightning can send some dogs into a frenzy. At first we thought that this dog wasn’t too worried about storms. 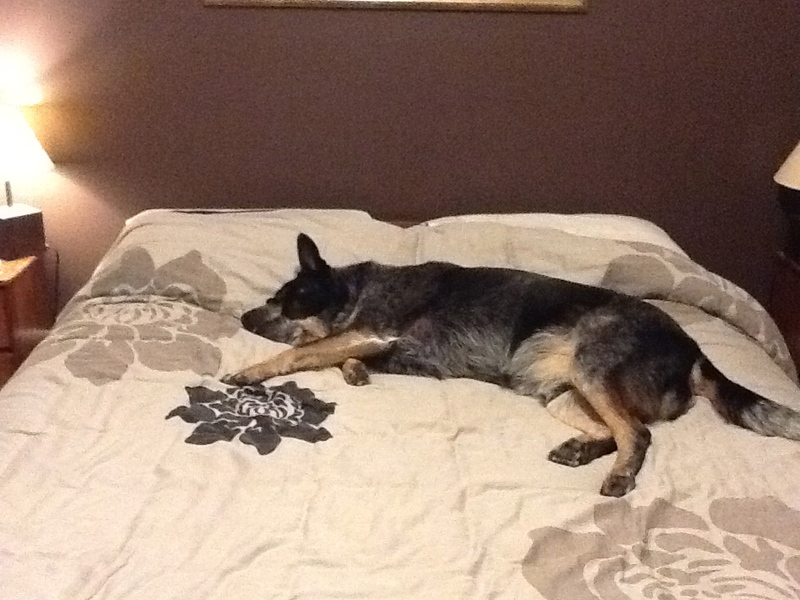 But during a recent storm with very loud and close thunder, our theory was disproven when 35kg of blue heeler landed on top of us on the bed in the middle of the night. Some toys are seen as ‘take it or leave it’ but others are prized possessions. 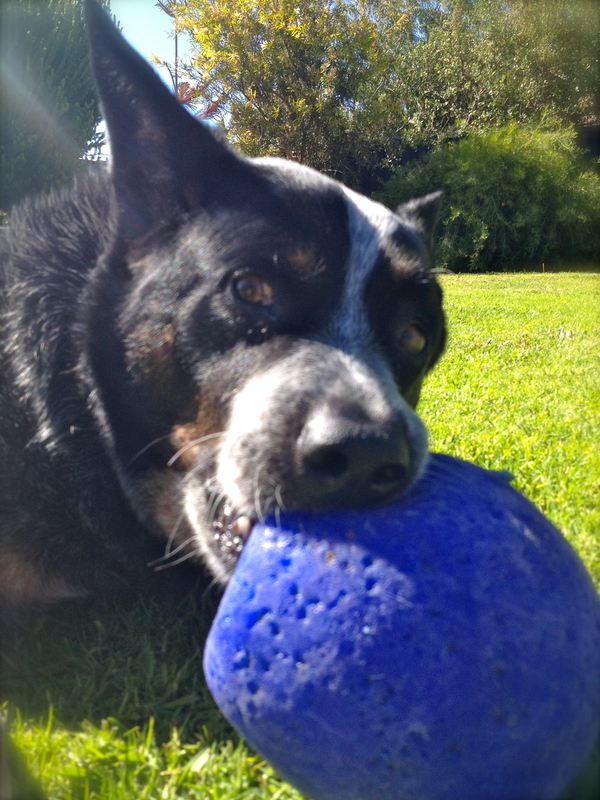 The big blue jolly ball is his all time favourite, followed closely by the red Kong ball. The hard rubber tennis balls that are used at the park are like the crown jewells, but we cannot leave them with The Dog unattended or they are shredded and eaten within about 17 minutes! Every visitor to our home is a potential ball-thrower, nothing more. When it is hot, The Dog loves to get wet. He has the weirdest habit of getting into what we have nicknamed ‘The Dozer’ position. He crouches down in the water just enough to get his chest and tummy wet, but keeps his backside up in the air. 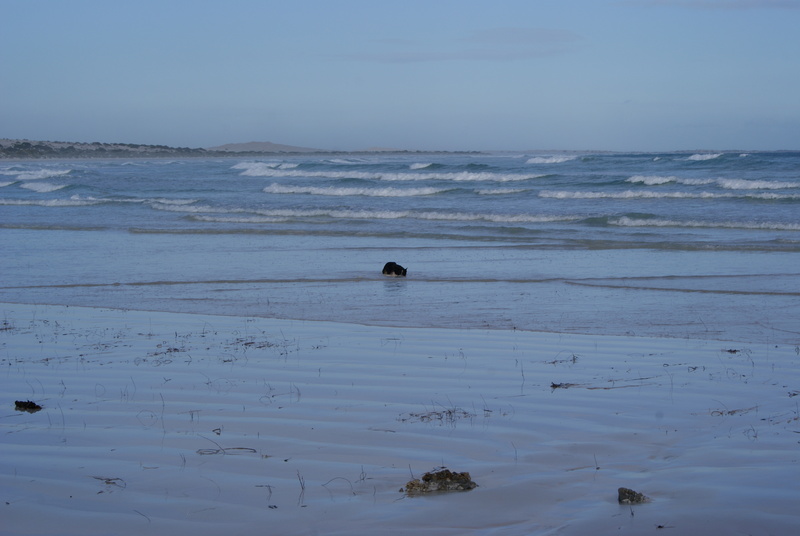 He pushes along through the shallow water like this – it’s hilarious. 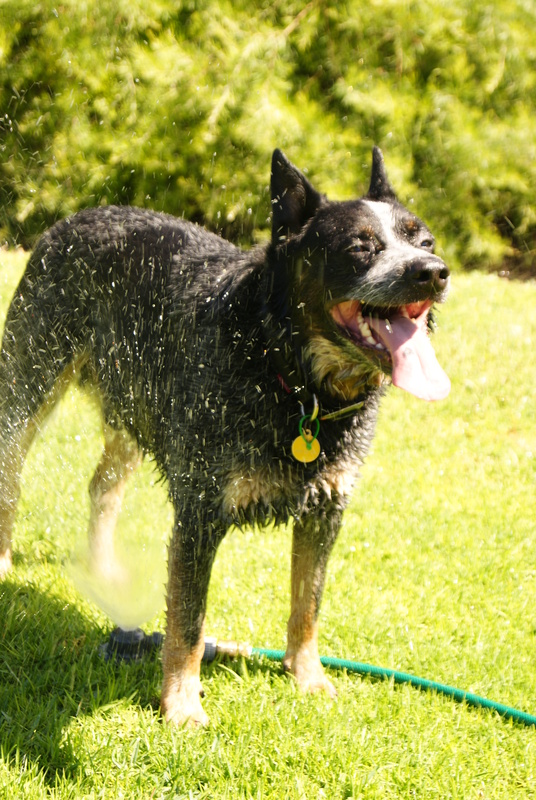 The Dog is also pretty fond of standing over a sprinkler on a hot day. 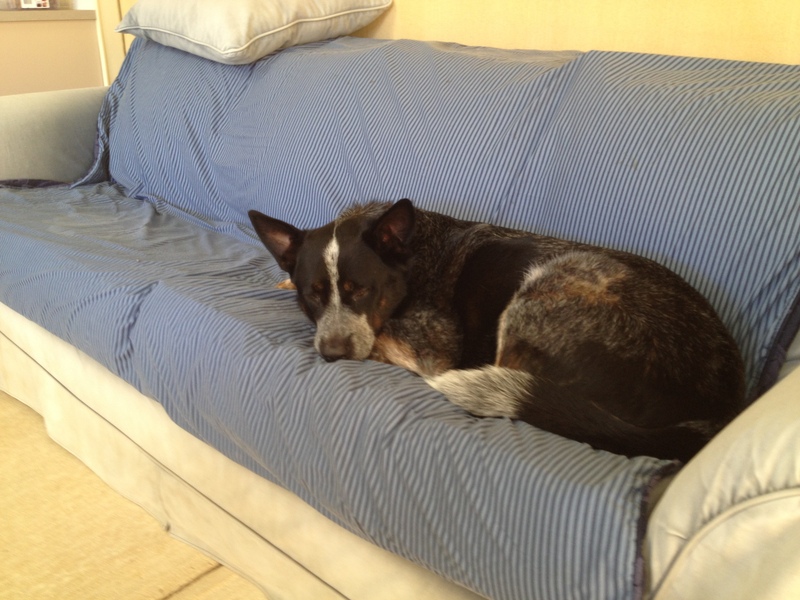 We trialled having another rescue dog in the house for a few weeks. But alas, The Dog was not keen to share anything with this new intruder, including his bro and The Nav. After three weeks of wishing and hoping they would get along, we came to the unhappy conclusion that the trial was not working. 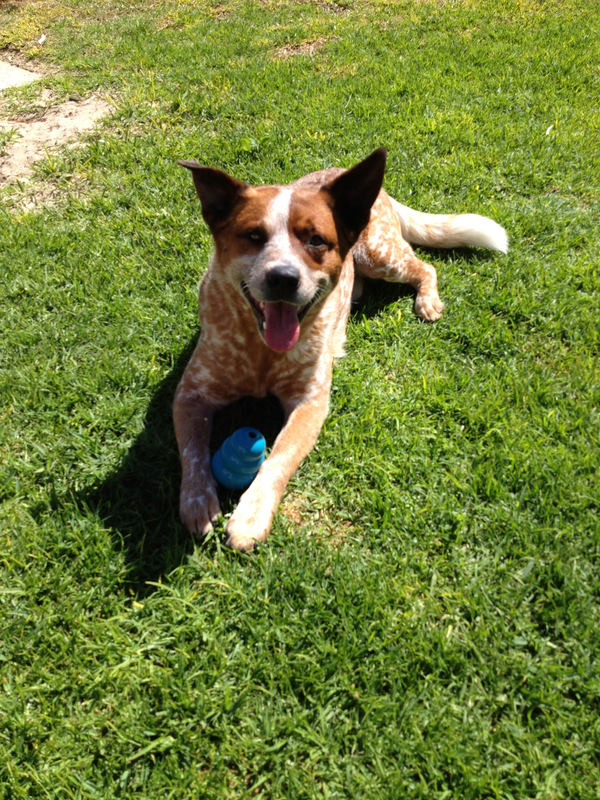 Fortunately for the little red dog, he found a wonderful loving home with a wonderful family. So back to The Dog. 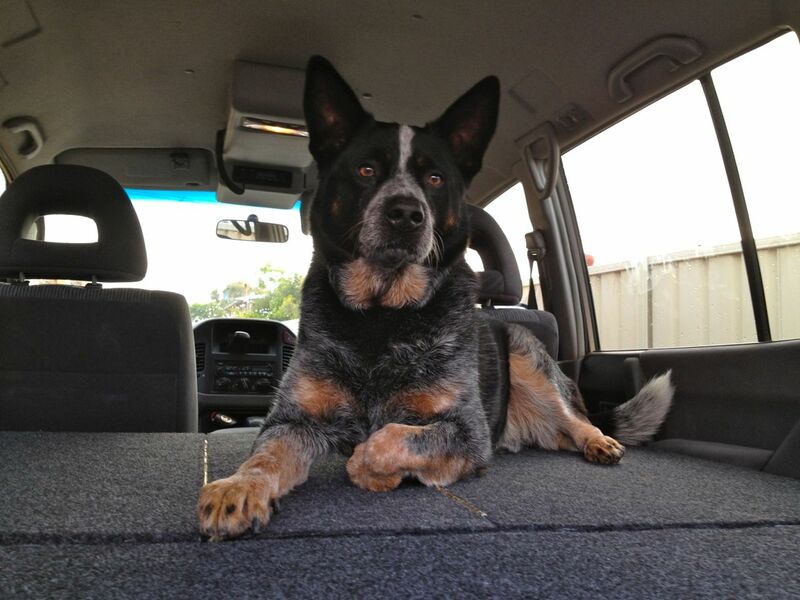 He has been camping, swimming, 4wd’ing and we’ve even taken him interstate. 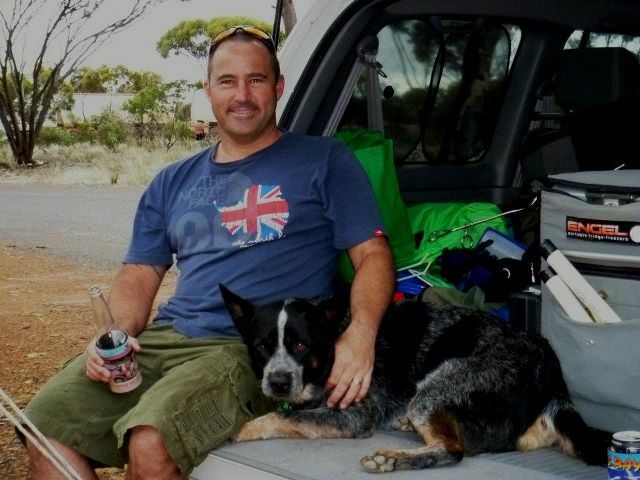 He has had short stays with his ‘grandparents’ and even been looked after by an in-house dog-sitter for a month. So to say that we now live in The Dog’s house is about spot on.